There’s power in a letter, in corresponding back and forth to someone else. There’s equal power in the words “thank you.” On December 10th, the children of Roxbury’s Franklin Elementary School’s aftercare program discovered just how much. That was when they received one of the best surprises of their lives, one that had nothing to do with Christmas gifts: It was simply an in person visit from one of their pen pals, Pennsylvania National Guard Captain Joe McLaughlin. The approximately 28 students of the aftercare program have been writing letters back and forth to McLaughlin for his nine-month long deployment in Kuwait since November. The writing letters campaign was the brainchild of Anita Fehsal who is in charge of the after program at Roxbury’s Franklin School and has been going strong for three years. 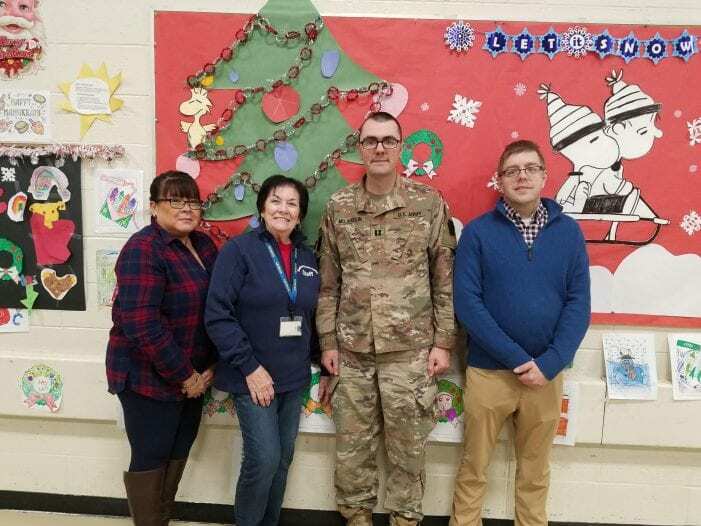 Fehsal discloses that she is from a military family and that she had worked at Picatinny Arsenal before retiring and giving her time, talents and boundless energies to various school aftercare programs. “I love it,” she enthuses. 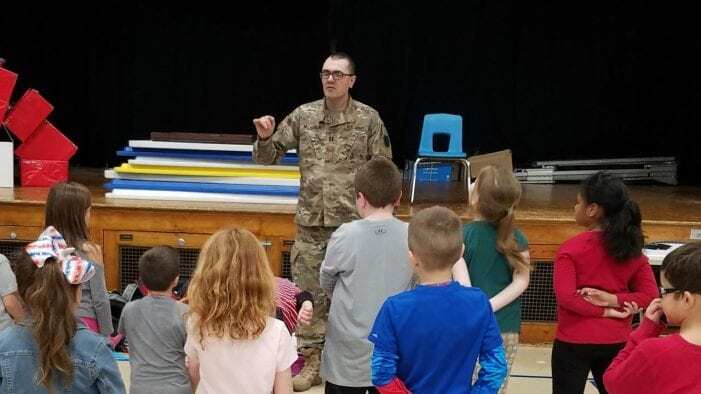 As someone who recognizes the virtues, heart and sacrifices of the men and women who wear the military uniform, Fehsal wanted to pass on that sentiment on to her students by reaching out to them and the kids were excited to do so. Fehsal shares that the kids would ask questions, ones that covered a vast span, some meaningful, some humorous, but all curious. They asked everything from “What is Kuwait like? To “Do you carry a gun? To “Is there a McDonalds’ where you are?” And she was impressed that McLaughlin would take the time to answer each and every one via email. Embracing the idea of writing letters to servicemen overseas, Fehsal believes it is a great thing for everyone everywhere, particularly children. It is an activity that is twofold, giving benefits to both the serviceman you receive the letters and the children who write them: For the servicemen, receiving letters gives them a bit of connection when they are in a different world at an insecure time. For the children, it is a way to express empathy, caring and gratitude and a way to say thank you. Fehsal explains that they began the program in November inspired by the Hundred Thousand Thank You’s campaign. The Hundred Thousand Thank You’s began on the radio Channel 103.3, when radio stations urged listeners to show their gratitude to those overseas by sending letters and care packages to them through Operation S.E.N.D. McLaughlin was so touched by the students’ generosity (and the generosity of their parents), he just had to visit to thank them for their letters. When McLaughlin visited his pen pals and their parents at the Franklin School Aftercare Program, they were elated. When the children saw him, they applauded; parents greeted him, shaking his hand. They had a whole celebration; everything was decked out in red, white and blue, and even saluted him. They had a flag, sang patriotic songs. Fehsal tells that McLaughlin was impressed that the kids knew all the words to the National Anthem. McLaughlin himself was a former Succasunna resident, out of the service now and working for Picatinny Arsenal. In addition to thanking them for their letters, snacks and well wishes, McLaughlin pitched right in, teaching the kids to do pushups and demonstrated how to lift a 52 pound backpack, and just enjoyed his pen pals. “It was great!” Fehsal enthuses. “He was so nice with the kids.” She was particularly tickled when he told the kids how much their letters meant to him. “ You made me laugh,” he had said. Giving back is nothing new for Fehsal, who inspired children to say thank you to other servicemen at various other after care programs at other schools including Jefferson.